The Big 12 is all about the new. There were four new head coaches trying to attract recruits. The top two classes were put together by coaches who’d just completed their second seasons on campus. The league’s identity will be retooled this fall. That started with the coaching hires and continued with the early signing period last December and then national signing day on Wednesday. 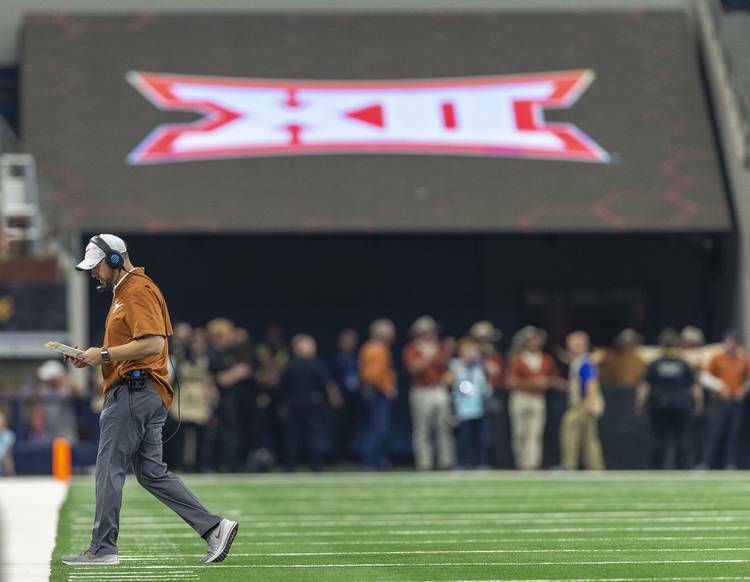 Here’s a rundown of how each Big 12 school performed with this year’s signing classes and some of the names you’ll need to know this fall. The scoop: Tom Herman’s last two classes have been ranked third in the country. That’s the first-time ever that UT has pulled off consecutive classes ranked that high. The class got a huge jump thanks to the addition of Bru McCoy, a five-star prospect who signed with USC in December. He’s enrolled in Austin. The top Texan is Jordan Whittington, a five-star prospect from Cuero. The early stars: Tyler Johnson, the top offensive lineman in UT’s class, could fill an immediate need. The Longhorns lost three starters on the offensive line from last year. He’s already in school and could be just as valuable as the two five-star receivers. The scoop: No question OU is an offensive powerhouse, producing two-straight Heisman winners in quarterbacks Baker Mayfield and Kyler Murray. OU coach Lincoln Riley’s class is top-heavy with offensive talent. While Alabama transfer Jalen Hurts — count him as a recruit — should be the Sooners’ starting quarterback this fall, the future star probably will be incoming freshman Spencer Rattler from Phoenix. He’s ranked as the top pro-style quarterback in the country. OU needs defensive help, but the Sooners’ top four highest-ranked freshmen prospects are offensive players — two receivers, a quarterback and a tight end. Riley hired defensive coordinator Alex Grinch as well as assistants for linebackers and cornerbacks since the early signing period. The early stars: It’ll probably be a receiver. And the guy drawing the greatest buzz is Jadon Haselwood, who is ranked as the top receiver in the country. The Sooners plucked him out of Georgia. He ranked No. 5 on USA Today’s Chosen 25 list of the top national recruits. He’s also a state champion hurdler, so he’s got the hops to add to his speed. If it’s not Haselwood who emerges as the star receiver, it could be Allen’s Theo Wease, who ranks as the third best receiver prospect in the country by 247Sports’ composite ratings. The highest-ranked defender is safety Jeremiah Criddell from California. Also look out for JUCO transfer Rhamondre Stevenson, who rushed for more than 2,000 yards last season. The scoop: Gary Patterson loves his defense. And this class reflects that. Of the 22 players he signed in December, 14 were defenders, with six each going to the line and secondary. But it’s TCU’s offense that needs a boost. It’s difficult to forget their 10-7 win over California in the Cheez-it Bowl. It took overtime for the Frogs to hit double-digits in scoring. Former Kansas State starting quarterback Alex Delton, a grad transfer, could provide a temporary fix. Max Duggan, a quarterback from Iowa, is the Horned Frogs’ highest-ranked prospect. He’s ranked as the fifth-best dual-threat quarterback in the country. Both quarterbacks are among the 11 signees already enrolled and will go through spring drills. The early stars: Wichita Falls tailback Daimarqua Foster is a four-star prospect and, on paper, is the second-best player in the class. He could see early time in a tailback rotation. Newton tailback Darwin Barlow signed Wednesday. He also is a four-star prospect and was the most outstanding player in the 3A state title game. The Frogs also need help in the passing game. JUCO transfer Mikel Barkley is on campus. He’ll have three years of eligibility. And there’s a sentimental name in the class. Waco Midway safety Tre’Vius Hodges-Tomlinson is the nephew of former Frogs great LaDainian Tomlinson. The scoop: Think Matt Rhule wants to improve his defense? Here’s proof. Baylor signed seven defensive linemen. And following that linemen theme, Baylor signed four guys for the offensive line. So the class of 2019 is decidedly heavy. Rhule also filled a need at quarterback, signing Odessa Permian’s Peyton Powell and San Antonio Jay’s Jacob Zeno. In Rhule’s first two seasons, he needed grad transfers to fill out the quarterback depth. It’s probably not a coincidence that both quarterbacks are the highest-ranked signees of the class and are the only two four-star prospects in the group. The early stars: Cedar Ridge standout Jaylen Ellis should compete for time in the receiving rotation. Any of the seven defensive linemen could have an impact as well. Permian’s Matt Jones is the highest-rated defensive prospect. He’ll play end. Garmon Randolph, a Georgia native who spurned offers from SEC schools, is a 6-7 defensive end who also played tight end in high school. Receiver Yussef Terry, who is from Philadelphia, is intriguing. He’s a former standout hockey player. The scoop: The Cowboys’ most significant pickup this recruiting season was new offensive coordinator Sean Gleeson. He replaces Mike Yurcich, who left for Ohio State after Oklahoma State’s Liberty Bowl win. Gleeson was Princeton’s offensive coordinator. The team led the FCS in scoring with more than 47 points a game. The Cowboys are known nationally for big offenses. This class should solidify the trend since five of the top six highest-rated prospects are offensive guys. The early stars: Oklahoma State needs a premiere tailback after Justice Hill decided to turn pro. They signed two backs who could immediately fill roles this fall. Deondrick Glass is a four-star prospect from Katy. He rushed for nearly 5,000 yards and 82 touchdowns during his three-year career. Coincidentally, he followed one of his main blockers — Cole Birmingham — to Stillwater. Oklahoma State also signed JUCO transfer Dezmon Jackson. Gundy’s best signee is tight end Grayson Boomer, who was ranked as the second best prospect in Oklahoma. The Cowboys also added former Colorado defensive end Israel Antwine, who enrolled last month. Oklahoma State also formally acknowledged the addition of Israel Antwine, a defensive end who transferred from Colorado at the beginning of the semester. The scoop: Matt Campbell needed to shore up his quarterback depth after three quarterbacks left the program last year. So graduate transfer John Kolar (Oklahoma State) and Easton Dean will join standout Brock Purdy on the roster. Campbell also added defensive back Isheem Young on signing day. Young’s signing was somewhat controversial. The former Penn State commitment from Philadelphia was arrested for armed robbery in 2017 and he served his sentence and earned his degree at a residential youth facility. The early stars: The Cyclones needed to shore up their running game after losing star David Montgomery. The top two prospects in the class are tailbacks — Breece Hall, who already is in school, and Jirehl Brock. Both are considered four-star prospects. The scoop: New coach Neal Brown didn’t have much time to get to know this class since he was hired last month after Dana Holgorsen abruptly resigned to go to Houston. Brown’s main job was to keep the 16 prospects Holgorsen had signed in December with the Mountaineers. Brown told them he’d allow them out of their scholarships. All stayed. “They just needed some reassurance,” Brown said this week. WVU added three prospects this week. Plus, former Sooner quarterback Austin Kendall joined the team as a grad transfer. The early stars: Safety Osita Williams, who could also play linebacker is some formations, may be the first freshman to see the field. Then there’s running back Tony Mathis, who Brown recruited when he was the head coach at Troy. But Brown said Mathis only was a “pipe dream” at his other school. Two junior college defensive players already are enrolled — cornerback Dreshun Miller and Taijh Alston, an end. The scoop: Under Bill Snyder, the Wildcats used junior college players to build and sustain a program. But Chris Klieman, who took over for Snyder in December, signed just two. Klieman, who split his December between coaching North Dakota State to a national championship and recruiting for his new school, signed 23 players. He signed K-State’s first prospect from Florida in a decade and then headed west to Arizona and California. He also piled up running backs, signing four. The early stars: Klieman lauded Florida athlete Joshua Youngblood, who rushed for more than 2,200 yards in his high school career. As a quarterback, he threw for more than 1,000 yards and he also can be a returnman. The scoop: The Jayhawks need an injection of talent everywhere. So that’s why new coach Les Miles, formerly of LSU, signed four defensive linemen, three linebackers and three cornerbacks. He also added a trio of quarterbacks, two running backs and a pair of receivers. He signed 19 players, which is four more than he thought he’d get back in November. The early stars: Miles got to sign a guy he’d recruited while at LSU. That’s Thomas MacVittie, a transfer from Mesa Community College in Arizona. MacVittie is a 6-5 pro style quarterback who can run the Miles offense. He first signed with Pitt out of high school. The scoop: Matt Wells, like all the other new coaches in the league, didn’t have much time to recruit. He signed only 18 players, seven of whom came on board this Wednesday. Quarterbacks always were important in the Kliff Kingsbury regime. Wells’ first QB signee was Maverick McIvor, the son of former Longhorns starter Rick McIvor. The final announced signee Wednesday also was a quarterback, Alante Brown of Chicago. He was a three-year starter for one of the best programs in the city. Last fall he threw for 41 touchdowns and ran for 12. He’s listed as an athlete for Tech. The early stars: Pearland defensive end Gilbert Ibeneme leads the class. Wells signed two junior college players to fill immediate needs, so keep an eye on tight end Travis Koontz and kicker Jonathan Garibay.